Brimming with luxury and comfort, villa Solara can easily accommodate up to 14 people, with additional beds that can be set upon request. 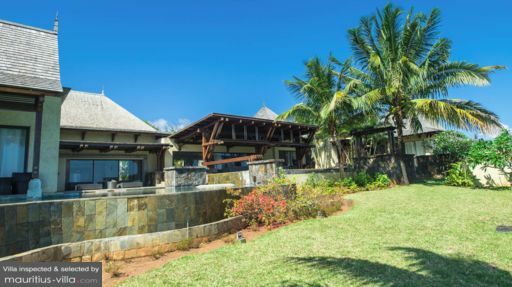 With an exquisite exterior which brings to mind the opulence of luxury resorts, this villa has just about anything you might need to enhance your holidays in Mauritius. Indeed, with a typical Mauritian architecture and generous living quarters, villa Solara is perfect for group holidays. Guests can additionally benefit from various types of amenities and perks. Villa Solara comes with seven fully air-conditioned bedrooms with twin and double beds. The three guest bedrooms share a perfectly equipped bathroom, with shower, toilet and double sink while the remaining four master bedrooms each have their en-suite bathrooms. These bathrooms also include a bathtub. All bedrooms are equipped with spacious wardrobes and safes where you can stow your valuables during the entire duration of your vacation. As soon as they walk into the grounds, guests are greeted by a majestic collection of water features designed to enhance the soothing atmosphere at villa Solara. 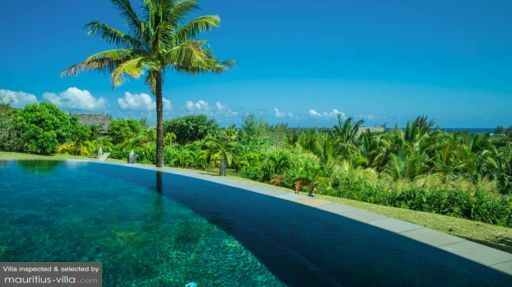 With a water bridge and even a shallow reflecting pool, a sauna and an undulating infinity pool, this villa also has a large tropical garden complete with palm trees, shrubs and stunning flowers. Boasting a succession of covered patios and terraces, the striking outdoors is also enhanced by a guest cottage which comes with a bathroom and three bedrooms. Best of all, Villa Solara’s garden is equipped with sunbeds where you can relax and work on your tan. Barbecue facilities have also been set up near the patio, which is beautifully furnished with an outdoors dining area. Villa Solara is entirely self-catering. As a result, the kitchen is fully equipped with various types of utensils and facilities which include- but are not limited to- a coffee maker, dishwasher, electric and gas stove, microwave, fridge and freezer, among others. The open-plan living area also include a spacious living room with wide windows for an airy feel. In the living room, you will also find a flat-screen television with satellite as well as exquisitely comfortable couches where you can simply lounge back and relax on lazier days when you don’t feel like going out. A dining room has also been set up for guests of villa Solara. A plethora of services has been set up to render your stay at villa Solara even more enjoyable. For example, at an additional fee, the villa can also arrange for airport transfers and babysitting services. You will also have exclusive and free access to a golf cart to navigate between the beach, the villa as well as the neighboring hotel. As far as the staff is concerned, guests can enjoy their holiday and not worry about the cleaning up since a housekeeper will show up every day, between 9am and 3pm. A welcome hamper is also offered to guests and this includes bathroom amenities, Nespresso capsules, floral arrangements, wine, water and the likes. A mere five minutes away from Villa Solara is the Heritage Golf Course, where you can work on your swing while basking in the glorious tropical sunlight. At Heritage resort, guests can also enjoy additional activities such as horse riding, water sports, tennis, kite surfing and the likes. 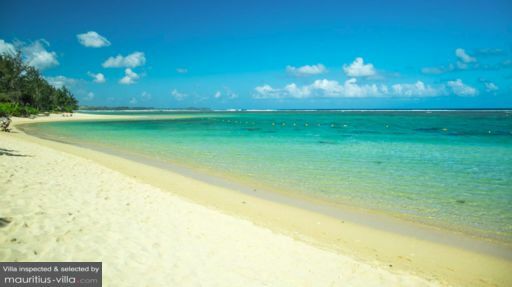 Villa Solara is also quite close to some of Mauritius’ most scenic islets. To visit these islets, you can simply arrange for a boat shuttle from the beach which is only 3 minutes away.